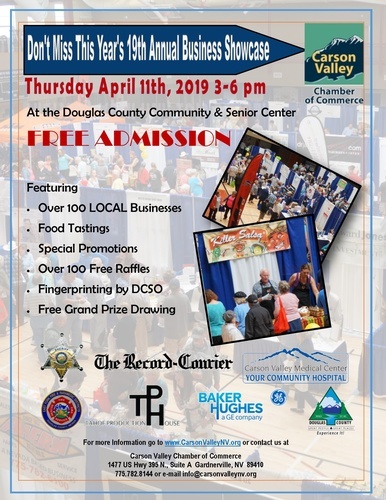 The Biggest Business Event of the year is the Carson Valley Chamber of Commerce Business Showcase. Over 1500 consumers come through the event in three hours to visit over 90 Chamber member exhibitors and see what the latest in products and services are. Restaurant members provide the food, every booth provides a prize for the free raffle, and visitors also get a free entry into the Grand Prize Drawing. You must be a Chamber member in good standing to have a booth, download the application here, If you'd like to get in front of 1500 potential customers in one day and are not a Chamber member, please click here to send us a note or call us at 782-8144.